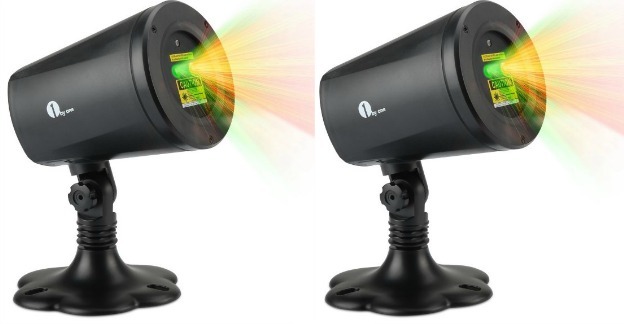 Indoor Outdoor Laser Christmas Lights Just $39.99! Down From $59.99! You are here: Home / Great Deals / Amazon Deals / Indoor Outdoor Laser Christmas Lights Just $39.99! Down From $59.99! I was so excited when 1byone sent me one of their Magic Outdoor and Indoor Christmas Laser Lights! I LOVE the thought of not having to mess with lights again! This is SUPER simple to use and to store! It has several patterns to choose from including lights and Christmas trees. You can make them flash or spin slowly, or be stationary. You can use it outside on the house or inside on the tree! It’s so versatile and yet, perfectly compact enough to store easily! I got it out when it first arrived to see what it could do and one of the grandkids was here and she LOVED it. Now, whenever they come over they all want me to get it out and show them again! They are all fascinated by the lights and love seeing all that it can do. I know I am going to be thrilled using it this year for Christmas! You can get one, too – if you have seen them on tv and wondered if they work, well, this one does and I love it! Right now you can get yours for just $39.99 – down from $59.99! Designed for indoors and outdoors – Never again go through the trouble of unwrapping and hanging individual strands of Christmas lights. Simply place Christmas Laser Light in the ground outside or on the floor inside and enjoy festive year-round energy-efficient lights that never need replacing. Star and Christmas Tree Patterns – Perfect for creating a festive atmosphere, this Laser Light projects both red stars and green Christmas trees onto any garden, exterior surface, or interior room. Broad Application – The laser lights can cover up to 2,100 square feet from a distance of 25 feet and can be set to motion, flashing, or simply stationary. It’s perfect for Christmas and holiday entertainment, parties, landscape decoration, and anything else you can think of. Automatic Timers – On at dusk and off at dawn. The integrated ambient light sensor will automatically turn the Laser Light on at sunset and off at sunrise. It can also be controlled manually using the button on the back of the light. Weather Resistance – Rated IP65 light casing, hide it amongst your landscaping without worrying about snow, rain, dust, and intense sunlight.